GHG emissions from the cement plant will be reduced by converting the clinker manufacturing process from wet type to dry type, and by introducing the advanced energy conserving technologies shown in yellow boxes in the below chart covering the entire cement manufacturing process. 78,000tCO2/yr of emission reductions are expected, by converting clinker manufacturing process from wet type to dry type (at 180,000t/yr production). Further additional emission reductions will be possible due to the introduction of advanced energy efficiency technologies/equipment. 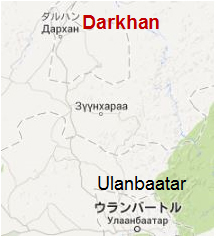 The cement plant is located in Darkhan, 200km north of Ulanbaatar. Based on “CSI Protocol” as a GHG MRV methodology proposed by CSI (Cement Sustainable Initiative under WBCSD (World Business Counsel for Sustainable Development), a JCM methodology applicable to the proposed project will be developed according to the Japan-Mongolia JCM Guidelines for Developing Proposed Methodology.